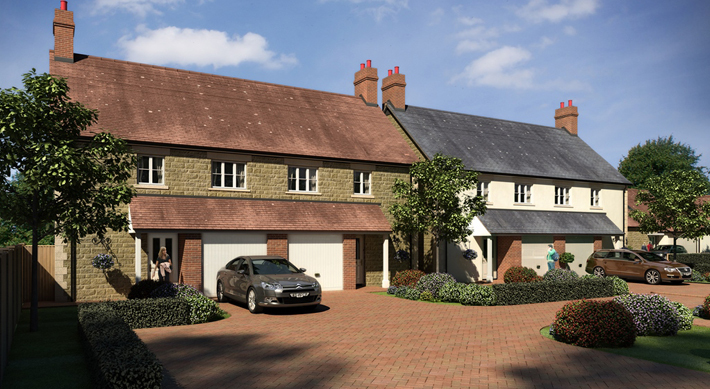 A distinctive collection of traditionally built, detached and semi-detached country homes. Situated on the east of the Mendips between Wells and Bath, with a countryside location, two award-winning pubs, a post/office/general store, clubs and sporting activities based around the village sports field, Holcombe is a thriving and welcoming village with much to offer. It has a mix of Georgian, Victorian and modern houses. There are two churches in Holcombe – the ‘Old church’ has late Saxon/early-Norman origins and is set a short distance from the centre of today’s village This beautiful, ancient church holds just a few services a year and is the burial place of Scott of the Antarctic, whose family grave is there. The ‘new’ St Andrew’s church is Victorian and is a large part of the community. Holcombe is approximately 12 miles south of the Georgian city of Bath and 20 miles from Bristol. The much renowned Babington House is a short drive away, as is the village of Vobster with the Vobster Inn restaurant. Commuter rail links are close at hand at Westbury (for London Waterloo), Bath Spa and Bristol (for London Paddington). Other stations include Frome, Trowbridge and Castle Cary. The nearby market town of Frome provides a wider selection of shopping, local amenities, two theatres, a cinema and a thriving artisan community. Bristol International Airport is also within commuter distance providing an ever expanding network of services. There are good choices for schooling in the area with private schools Millfield, Downside, Wells Cathedral, Stonar and All Hallows close by along with state secondaries, academies and primary schools in easy reach at Radstock and Kilmerston. Holcombe’s most defining characteristic is its rural nature. The village gives a strong sense of being ‘in the countryside’ either because of the immediate proximity of fields, woodland or meadows, or because of far-reaching views across unspoiled countryside to the Mendips. From Radstock, take the A367 southwards. At the roundabout take the A3139 towards Kilmerston. Turn right signposted Holcombe. 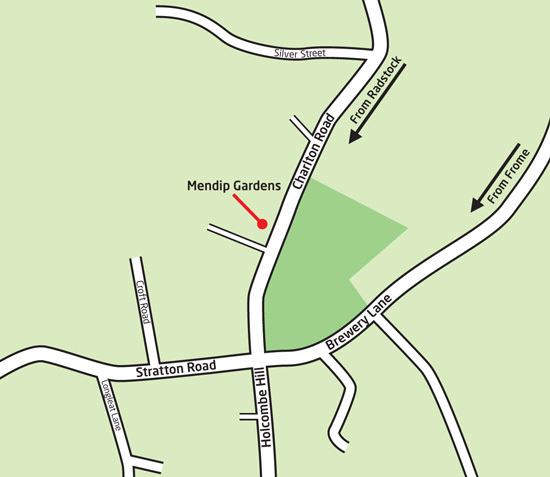 On entering the village, Mendip Gardens will be found on the right hand side. From Frome, take the road towards Mells. After approximately one mile take the right hand turning to Mells, continue along this road until reaching a T junction, turn left towards Vobster and Coleford, continue straight through the village of Coleford. On leaving the village take the left hand turning at Lipyeate, follow this road to the crossroads at the top of Holcombe Hill, turn right and Mendip Gardens will be found on the left after a short distance.